Make your store more user-friendly, provide your store visitors a convenient overview of the website. At the same time help Search Engines crawl and index data better by spreading the necessary ranking power with internal cross-linking. Auto-update if there is any change in the store’s structure. Include/Exclude links, products, categories, CMS links in the sitemap. Why do you need this HTML sitemap Extension for Magento 2 store? HTML Sitemap is valuable for your users as it allows them to find any page within your site quickly. Moreover, HTML sitemap is a very efficient way to distribute your link juice among the pages of your site. So Google bots can crawl and index all of your pages in one sitemap. That’s indeed fast and simple SEO practice to do. *Check out Magento 2 SEO Extension including Magento 2 Dynamic HTML Sitemap Extension and 3 others extensions which can improve your SEO now! Dynamic HTML Sitemap generation is automatically after installing the extension. Links to categories, products, CMS pages and store views of your Magento 2 store are all included in the sitemap. What happens with the sitemap for e-commerce store if there are any changes in your store? No need to worry as the Magento 2 HTML sitemap Extension will update the sitemap by itself. 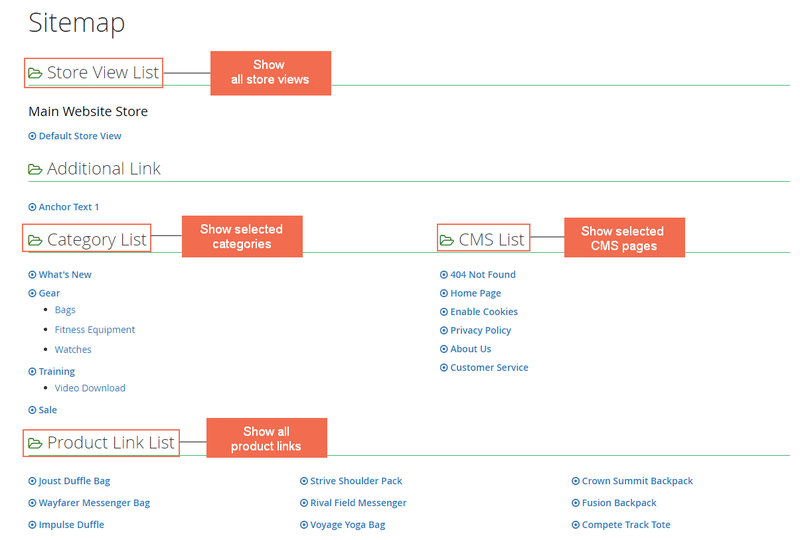 Include/Exclude links, products, categories, CMS in the sitemap. Not only contains the ability to exclude links of product, category or CMS that you don’t want to show, but the extension also gives you the ability to add any links and edit the anchor text of them on the sitemap. Give customers what they interested in first to get better User Experience. Magento 2 HTML sitemap Extension gives you the ability to define the order of which will be displayed first among Product, Store View, Additional Link, Category and CMS Page. Got multi-store views that cannot use one HTML sitemap? This extension can create unique HTML sitemaps for each of your store views. Define The HTML Sitemap page Metadata such as Meta Title, Keywords and Description, which are essential for search engines to understand the content of the page better. Site owners tend to ignore the HTML sitemap in Magento 2 and just focus on XML sitemap only. But I thinh HTML sitemap is also crucial as it get indexed by the crawler bots, too. Nice module. Work smoothly on my store. Good module at a cheap price. All the features work well as described. I was supported by a technican who know very well about Magento. Great help! The module works well as described. Support team is fast and always answer me asap.